The modern fairy tale ending is the reverse of the traditional one: A woman does not wait for Prince Charming to bring her happiness; she lives happily ever after only by refusing to wait for him -- or by actually rejecting him. It is those who persist in hoping for a Prince Charming who are setting themselves up for disillusionment and unhappiness. 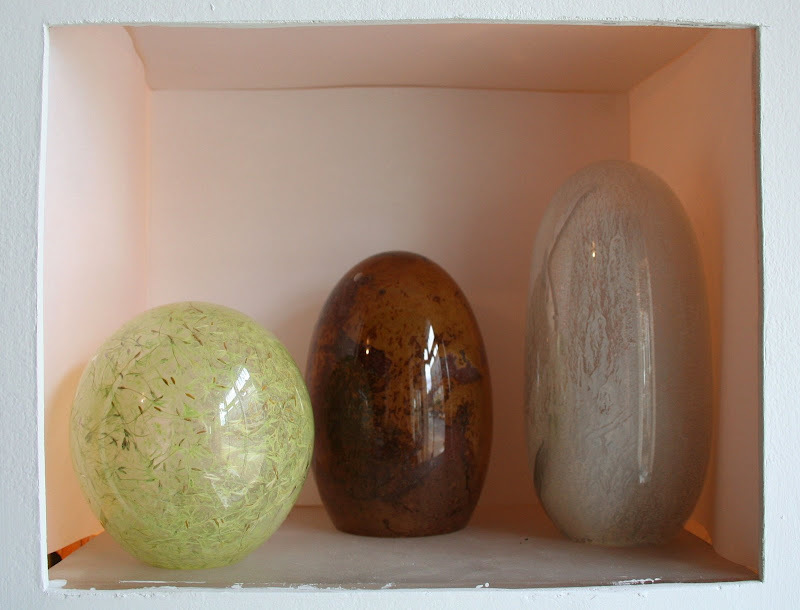 5) glass balls filled with assorted natural or found objects, senior exhibition by cia graduate catherine stackpole. catherine is a very talented fiber and glass artist, unfortunately I don't know where's she gone off to, but I expect she's still making lovely and provocative work. by the way, it doesn't have anything to do with glass, but if you didn't click on the link for emily carr you are missing out on information about a wonderful read! I LOVE your post! We could be ethereal twins, you and I. I love glass! I have many similar pieces and almost used pieces of my collection, stained glass I have in my house that my mother made, and Chihuly. Is Mirrormask, Neil Gaiman's? Kudos, mouse! kimy, you know I love your blog, right? But this post? I bow and say: thanks for all the riches it contains and for the way you brought them all together. Hildegard and stained glass gorgeousness - vat can I say? The Beauvoir quote nails it for me. And that sculpture! That I like. Great post, as always, Mouse. The answer, Faludi finds, lies in a historical anomaly unique to the American experience: the nation that in recent memory has been least vulnerable to domestic attack is also a nation haunted by a centuries-long trauma of assault on its home soil. For nearly two hundred years, our central drama was not the invincibility of our frontiersmen but their inability to repel invasions of non-Christian, nonwhite "barbarians" from the homestead door. To conceal the insecurity bred by those attacks, American culture would generate an ironclad countermyth of cowboy swagger and feminine frailty, which has been reanimated whenever the nation feels threatened. On September 11, Americans were once again returned to an experience of homeland terror and humiliation. And, once again, they fled from self-knowledge and retreated into myth. I quoted from the Faludi book review above in bringing out what she considers a national paeranoia , a fear combatted by countermyth , an attack by the barbarians as many would term them. Some myths however contain cosmic truths such as those of the ascended masters of the most ancient duration. Oh, those are some beautiful pictures. I think the glass sculpture is just gorgeous. All the colors are fantastic. 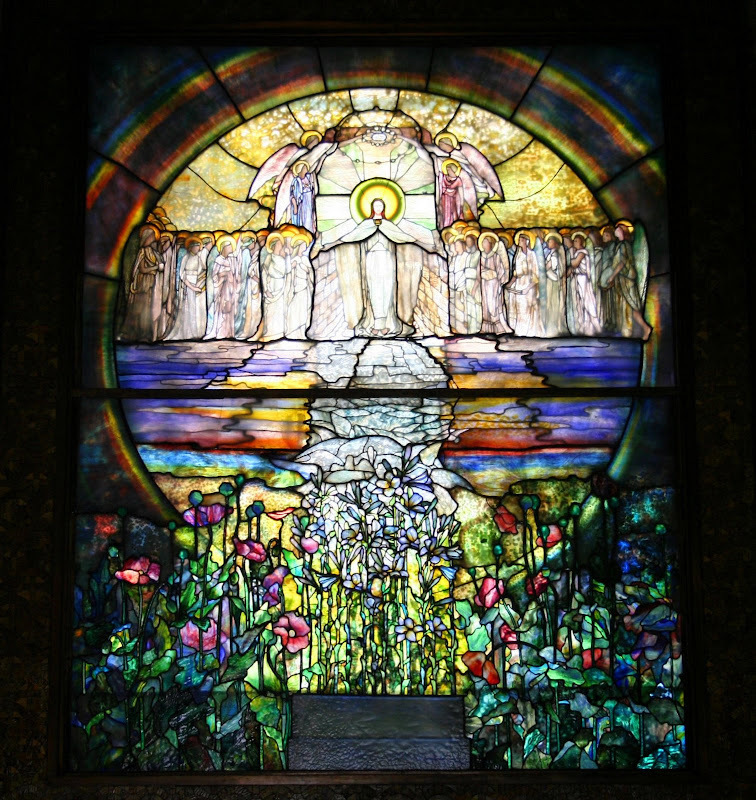 I wish the houses of today had stained glass windows, it is just something that is missing so much from them. And to be able to make glass objects d art would be so great. It is fascinating to watch them take a mixture of sand, silica and other additives and turn it into something useful and beautiful to look at. I have enjoyed the clarity and perceptiveness of quotes attached to the photos. You have a blog that provokes learning and exploration. I even enjoy the quality of your commentators. Love Carson's quote & mirror, the B&B stained glass, and the book club shot! The quotes and photos together were inspiring on this humdrum Thursday morning! Thank you! These are really remarkable photos & quotes even by your high standards-- especially love the Carson pic & quote & the stained glass window & Hildegard Von Bingen quote. 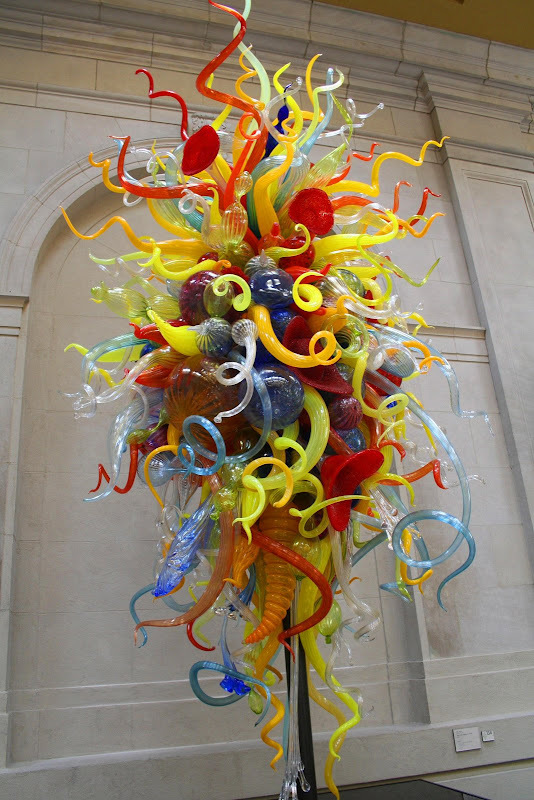 My favorite would have to be the marvelous Chihuly in my favorite local museum!! Great glassy post, Ms. Mouse. WOW! Mouse Medicine, we must be kindred spirits. I intend on visiting Bingen and the Rhine next time (if there is one) that I'm over. I'd better brush up on Hildegard. I do have Emma Kirkby singing some of her comps. I adore Emily Carr's writing more than her art. I saw a glass sculpture like that one here in Toronto. It was $100,000CA. Not kidding. As much as 10 of my cars. And, last but not least. Loreena McKennit. She kept me compnay over Christmas. Love her. 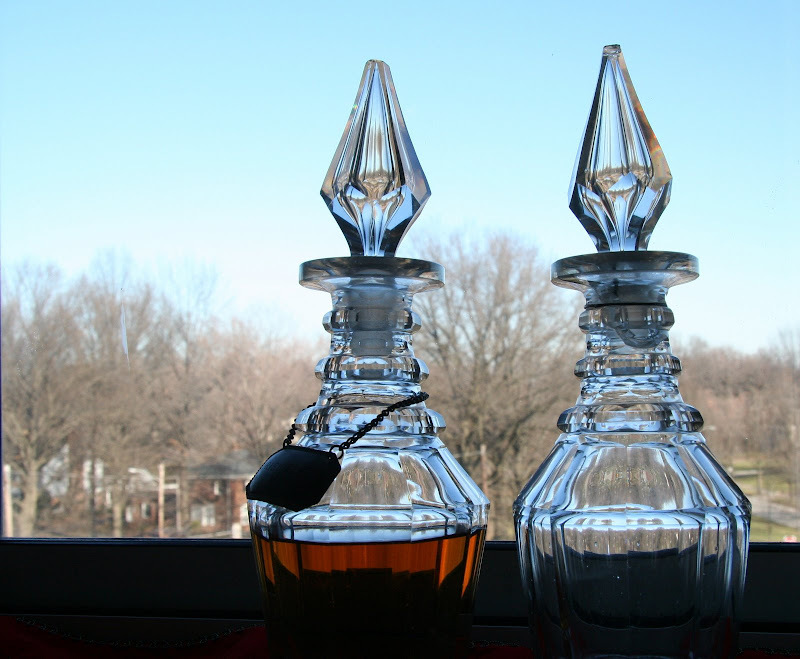 I especially like the decanters. Such sharp focus! Wow! This is quite the collection, both of photos and quotes. And the video is great, too; I love Loreena McKennitt, and I really like what the videographer did to visualize the song. ronda - thank you! how wonderful that your mom made stained glass and you have pieces of it.... I don't know if mirrormask is neil gaiman - i just really liked how the song was visualized! rlb - your remark has made my day, geez my month!!! I can always count on you to pick up the hidden layers - like the mask in the mirror in rachel's room! I almost put rosa's quote under the tiffany piece but I thought that would have been too much! thank you so much for the info on emily's nickname - I did not know that. I find her brilliant.... such a use of color and her writings. and then of course there is her love and devotion toward animals. sub- you are welcome!!! I look forward to popping over to see your post on the theme! have a few minutes to make some rounds before heading out and being disconnected. mrs - thank you. 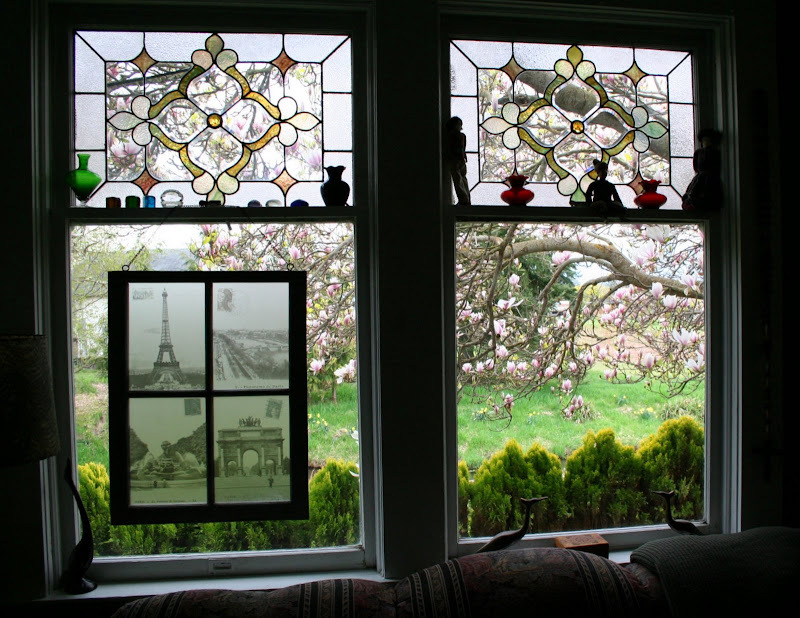 there are plenty of old stained glass pieces about that one can always add to one's house! and sometimes you can even find a piece that isn't too expensive.....of course it won't be a tiffany! candi, betty big, big smile!! john - ah, another month added!! willow - I only visited the columbus museum once specifically to attend a showing of avedon's photos - but it's time to return.... actually I need to get down before april 12th as the exhibit of murray jones work sounds terrific!! have you checked it out yet? edward - you are the sweetest kitty in the universe! As always a post so wonderful that one wants to go back and re-read!! The pictures and quotes are excellent. Thank you for this! these pics are astounding! beau-ti-ful! 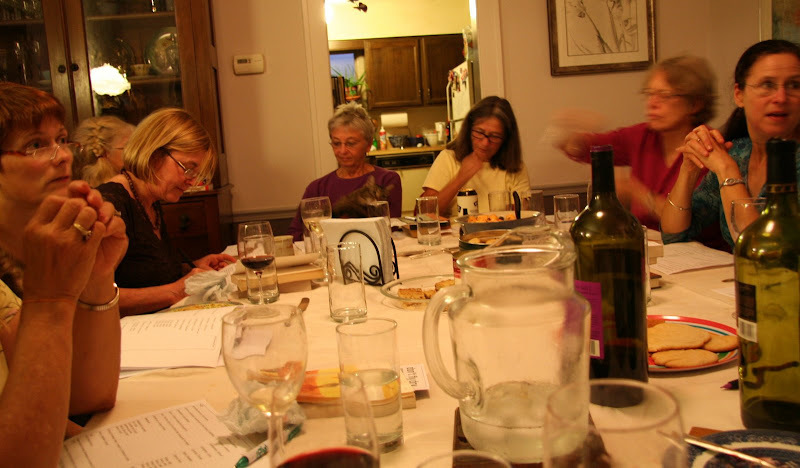 Love all the pictures, but especially the book group! Nice! I really like that blown glass art piece. There's something similar in the Belagio hotel in Vegas...theirs hangs down from the ceiling. "Allow your senses to take flight as your gaze ascends to appreciate this vivid piece of creative expression commissioned by world-renowned artist, Dale Chihuly. This piece de resistance is the quintessential complement to the welcoming lobby awaiting your arrival"
nice. love the nostalgia of the first pic. great pics and the Emily Carr quote does it for me. amazing. Great selection of glass portrayed. Loved the quotes as well, especially the one about Prince Charming. Thanks for visiting me this morning! There is so much beautiful glass that it is impossible to comment. I just knew #6 was Chihuly. His work is so distinctive. The glass balls are amazing! So much colour! I specially like the b&b. Did you stay there? Thanks for another beautiful post and thanks for the nice words over at my place today. I was a bit cranky when I put my post up and you made me feel better! I am so far behind everywhere everything. I got laptop elbow. These pictures and quotes are so beautiful that they feed my creativity. I especially love Rachel Carson's window..how beautiful is that? What a wonderful post, thank you..you collection sustains me. Fantastic photos and a great post, as always. Thanks for the card! The video is from the Neil Gaiman/Dave McKean film "Mirrormask", which you might enjoy. Wonderful photos. I especially liked the first one. Thanks for sharing. That B&B window looks inviting! e - hey good to have you in the hood! the guy, chris, well he's one of the artists at the glass bubble project. I haven't been by in a few months but he's always great fun to chat with and and share a beer with...in the summer the temps are incredible in the gbp! as far I know he's single, you looking? tee hee! he is a cutie! elw - thank you and thanks for dropping in! see you around! me - you gotta really nice place to dance through. thanks for brightening up the hood! The images, the quotes, the graphic presence: all a rich feast. I can fast the rest of the day. Well done. I love Dale's glass sculpture thingy. Really neat and quite intricate. The welder has an air to Jesus! LOL! 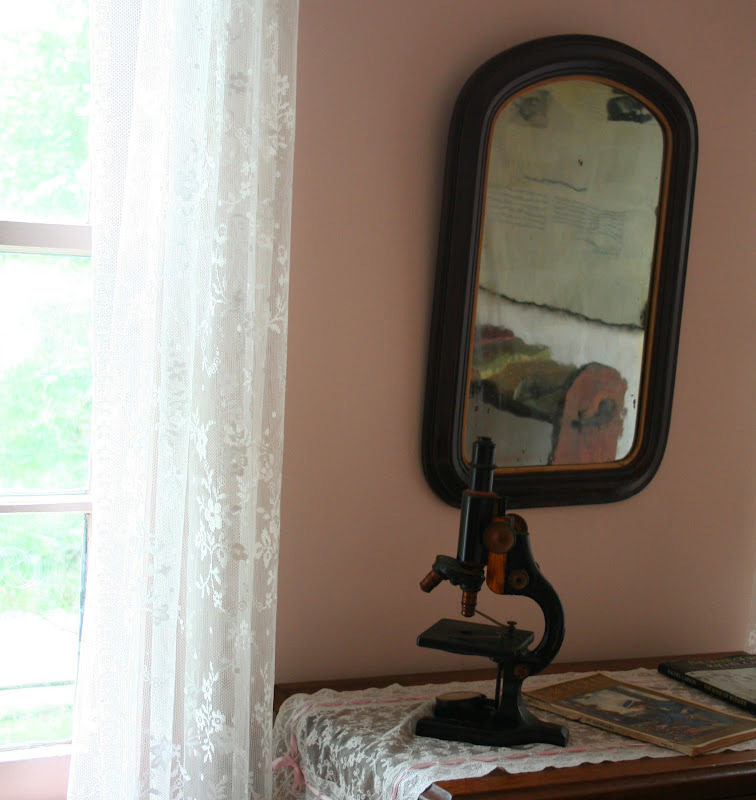 I do like that microscope. Sorry I'm so late. I tried to comment yesterday but . .this is the winner this week. Totally gorgeous both the quotes and the pictures (not much red left in those bottles now!) You're a talent to contend with, seriously. . fantastic stuff. I've been to Chihuly's studio. It's pretty cool. It has a rectangular pool with a plexiglass floor in the center, beneath which is an assortment of glass shells. A great way to tour Ireland is to look for stained glass windows by Harry Clarke.